The next winner in the ScanMed QR giveaway is Lisa Tabbi! Congrats Lisa!I'll be forwarding your contact info soon so you can collect your prize! Don't forget to enter for YOUR chance to win! First Sca Med ID Winner! Hey guys just a quick post to announce today's winner of the ScanMed QR ID kit : Beth Toner! Beth I'll be forwarding your contact info to the wonderful people at ScanMed QR. For everyone else, don't forget to enter for your chance to win!!! Hey guys! I'm headed out of town this weekend, but before I go I've got an awesome giveaway for you guys that will be going on all week next week. I've talked about it many times on the blog, but I think medical alert identification is super duper important for EVERYONE who runs, but especially for those of us with asthma or other medical conditions. I'm very lucky in that at most of my races someone I know is there with me, but in my training runs that isn't always the case. I have been in several situations where I was having an attack and either passed out or was coughing/so unable to breathe that I couldn't communicate. It's really important that you have information readily available to those who would need it in case of an emergency, and it will give you more peace of mind too! So, enter Scan Med QR. Scan Med QR is medical alert identification with an updated twist. A basic kit comes with a wallet card, a keychain card, and (I'm told very soon) a shoelace tag (right now I'm keeping my extra keychain card tied to my laces). The cool thing about these Id cards is that they come with a QR code. The QR code links to a page that has all of the information you want on it. What's the advantage to a QR code Id system rather than a standard medical alert? More information: On my previous bracelets I've never been able to include more than my name and condition and an emergency contact. This has room for as much info as you need! More places at once: The cool thing about the pack is that you get 3 options to keep where you want so that you never have to worry about turning around because you forgot it! 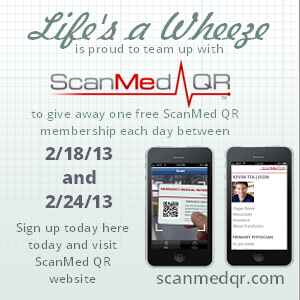 Tweet "@lifesawheeze is doing a giveaway with @scanmedqr this week and I want to win!" Each one of these will count as an entry into the giveaway. Once you do that fill out the following form and I will choose a winner every day next week and announce it both on the blog and twitter! Good Luck Everyone! Hey guys! I wasn't sure I should post this, because I don't like to "sink down to that level" but I keep hearing about people thinking about signing up for this scam and I wanted to spread the word. Many of you have heard of PV Body, now called Ellie. It's a subscription service that sends you cute fitness clothes each month. It honestly sounded like the most awesome thing ever when I heard about it and I immediately signed up. I got my first package from them and was absolutely thrilled. However, today was the release of their new line Ellie and I went on their facebook to see a bunch of crazy. Not only were there tons and tons and TONS of customers complaining about orders they had been charged for (some months ago) and still hadn't received, but their website was down. After looking for a few hours with little comment from PV Body, they re-opened the site sort of and none of their paying customers could get to their accounts and will not be able to until next week. Snappy Tuna - This is a link to the Better Business Bureau site with a slew of complaints and a statement that the owners website was abandoned and customers problems were never resolved. PV Body -BBB link for PV Body already filling up with nasty reviews. This one is mostly so that you can add your own experiences! Bottom line: PV Body is most likely a scam. I'm putting this info out there so that hopefully I can save my readers some heartache or help them to get out fast. Please pass on this information as PV Body is trying to hide it on their facebook (I posted links to these sites and it was deleted and I was banned from their page immediately).